The Tide Is Turning for a New Source of Green Energy | "Global Possibilities"
The first underwater turbines are connected to Scotland’s power grid. Two turbines installed off Scotland’s coast aren’t harnessing the country’s winds to generate power. Instead, these blades are spinning underwater, using an even more predictable renewable power source in the region—tides. 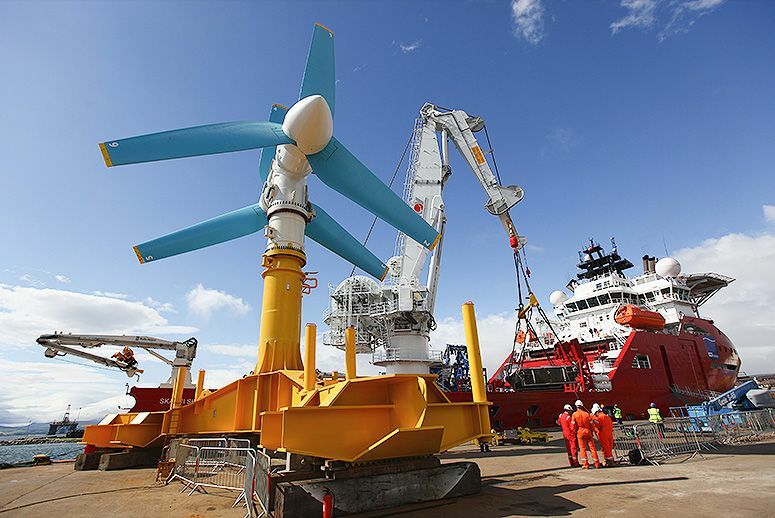 The offshore array is the world’s first network of tidal turbines to deliver electricity to the power grid, according to Nova Innovation, the company behind the development. That’s a big step for green power generation, as it shows commercial viability for a marine-based power source to create renewable energy. Unlike solar and wind power, where power production stops when the sun isn’t shining or when the wind stops blowing, Nova’s tidal arrays continuously generate electricity by using perpetual incoming and outgoing tidal currents to spin its underwater turbines 24 hours a day, 365 days a year. So far, two 100-kilowatt turbines have been installed in the turbulent tidal stream of Bluemull Sound off the Shetland Islands—an archipelago about 120 miles north of mainland United Kingdom, where the North Sea meets the Atlantic Ocean. Nova is planning to construct five turbines in the region, providing power to residents and businesses on the Shetland Islands. The islands aren’t connected to the U.K. grid, so its 23,000 residents rely on a diesel-fueled power station for most of their electricity. The 0.5 megawatts expected to come online from the underwater turbines would minimize the need for the tanker-supplied fossil fuels. Lang Banks, director at World Wildlife Fund Scotland, said the tidal array is an example of how the technology can help communities reach emissions reduction goals. While the $3.9 million Shetland tidal project is small, marine energy’s potential looms large. Renewable energy agency U.K. Carbon Trust estimates a $165 billion global tidal energy market could be developed by 2050. The thousands of potential locations for tidal turbines could boost zero-emission energy, eliminating millions of pounds of greenhouse gas emissions that would otherwise be released through fossil-fuel-burning power plants. The U.S. Energy Department estimates tidal streams in the U.S. could generate enough electricity to power nearly 30 million homes a year. The industry, though, is still in its infancy. Some projects in the works include French company OpenHydro, which says it is close to linking two tidal machines off Brittany to create a 1-megawatt tidal array. U.K.-based Tidal Lagoon Power has proposed to build a tidal turbine system called the Swansea Bay project that would generate 320 megawatts. In the U.S., companies in Oregon, Washington, and Maine are in various states of trial and testing of tidal power systems. This week, the federal government selected 10 organizations to share more than $20 million in funding to be used to explore ways to generate electricity from ocean waves and tidal currents. The ocean’s constant motion is a boon to steady power production but a bane for engineers, who must develop a cost-effective generator capable of withstanding the relentless pounding and corrosive marine environment. On the Shetland Islands, residents are weighing the environmental impacts that would come with a beefed-up tidal array system against the potential impacts of a planned wind farm. One group, known as Sustainable Shetland, has been fiercely opposed to a proposed 103-turbine, 307-megawatt wind farm that’s been in the works since 2008. Frank Hay, chairman of Sustainable Shetland, said the project would replace environmentally important peatlands, and many of the turbines would be placed within 1.5 miles of residences. Hay said the group is not opposed to the smaller-scale tidal array but questions what a big project would look like. Government officials have already designated two regions south of Shetland—Pentland Firth and Orkney Waters—as Marine Energy Parks, aimed at streamlining the commercial-scale leasing process to get potential prototypes and projects online faster.